CUCUTA, Colombia – Secretary of State Mike Pompeo is demanding that Venezuela’s embattled president Nicolas Maduro stop trying to block humanitarian assistance from entering the country. 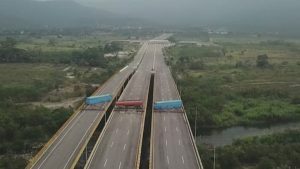 The demand comes as Venezuela’s military barricaded a border bridge with Colombia in an apparent attempt to block shipments of emergency food and medicine. U.S. officials say the first truckloads of aid destined for Venezuela have arrived in Colombia. Maduro has said he doesn’t want U.S. aid. But the country’s self-proclaimed interim president, Juan Guaido has said aid will begin flowing. The blocked bridge is at a key border crossing between Colombia and Venezuela. Colombia says it is prepared to help distribute aid from the border town of Cucuta. Venezuela suffers from hyperinflation and severe shortages of essential goods. But Maduro claims the United States wants to colonize Venezuela and exploit its vast oil resources. Opposition leader Guaido has vowed to oust Maduro and restore Venezuela’s democracy.